It is botanically known as Ricinus communis. Did a quick search and so happy to have nailed its ID. We chanced upon this beautiful shrub growing by the roadside in the neighbourhood and it was love at first sight! Captivating reddish-purple or purplish-maroon leaves that are deeply lobed, similar to the palmate leaves of Acer palmatum ‘Bloodgood’ (Red Japanese Maple). And, the shrub was heavily laden with ripened fruits and dried seed pods as if waiting to be hand-plucked! Hmm…I did as expected and happily brought home some seed pods late last November. However, I finally sowed the seeds only in mid January. Aargh…what a procrastinator I am! Wonder why I delayed needlessly in propagating this eye-catching Castor Bean Plant when it was such a breeze sowing the seeds. Simply scatter the smooth and glossy seeds about 3-4 cm apart and push them just below the surface of moist potting medium or garden soil. Then, locate them in bright light or at sunny spots and with normal watering, seeds will germinate within a week or so! 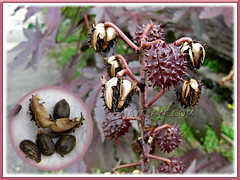 A couple of photos to illustrate our success in getting some Castor Oil Plant seedlings for our tropical garden by this simple and easy method of seed propagation. Waiting eagerly to see them shoot up to decorate our front yard with their beautiful and uniquely coloured foliage! Hope to do another article of this beauty in the near future with a more complete plant profile to include in our plant database. 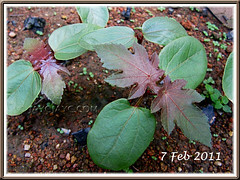 (Update: June 5 2012 – check out our article on Ricinus communis here). Other info: Though popularly grown as an ornamental plant, be aware that its seeds contain the toxic protein ‘ricin’ that are poisonous to people, animals and insects. 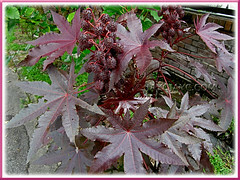 Know more about Ricinus communis at Wikipedia and Istria on the internet. I have seen this one grown on roadsides and abandon areas many times. Often never really took notice of them but most of the times – I seen them all in green. This however look different as they are in red. And yeah, since they are poisonous – I have refrained it from my garden as my 2 year-old boy have a tendency to pick up things in the garden, play and sometimes put it in the mouth misceviously. Yes, the Castor Bean Plant has a number of cultivars. Bet this colour is lovelier than the green ones, right? You’ve made a wise decision, James…better be safe than too late to regret! Oh, Jacqueline, this is a very familiar plant to me, one that I use to see by the roadside when I was little. Seeing this plant has brought back a lot of fond memories as I have forgotten all about its existence. What a pleasant surprise! Delighted to know your visit here gladden your heart, A. Belle! We never had the pleasure of discovering this plant before…it was a first time for John and I. Very nice and informative website you have. This red plant really look nice as decorative plant. Wonder where can I get one of those for my garden ?